The table had a few scratches to the very side of the table but it’s not very noticeable. Fit perfect in my small space. The chairs are sturdy. Adorn your living space with this sleek Baxton three-piece pub set, including an adjustable-height bar table and two matching adjustable swivel stools with footrests. Featuring a wood tabletop and faux leather seats in a sleek white color, all pieces of this set have a chic chrome metal base. Thanks to a pneumatic, gas-lift mechanism, the table adjusts from 26 to 36 inches high and the seat height adjusts between 24 and 30 inches. 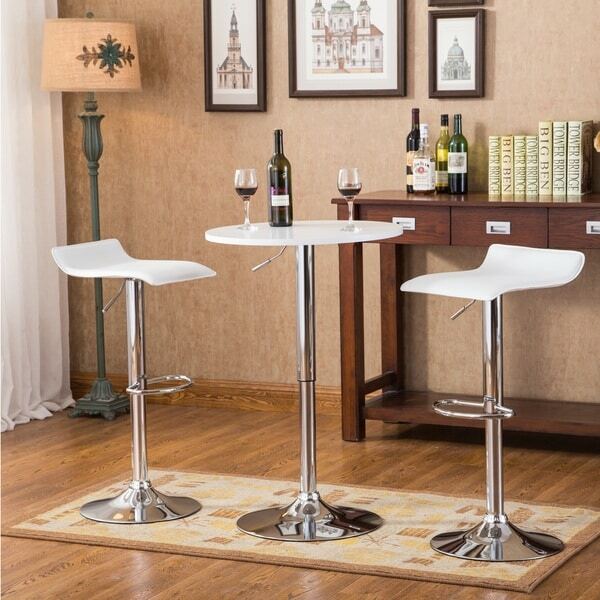 3-piece adjustable height bar set includes one bar table and 2 bar stools. Stool features a sturdy chrome base and a handy lift mechanism with a built in 360° swivel function and footrest that allows the stool to adjust from counter to bar heights. Table features an adjustable pneumatic, gas-lift mechanism, table height adjustable from 26'-36'. 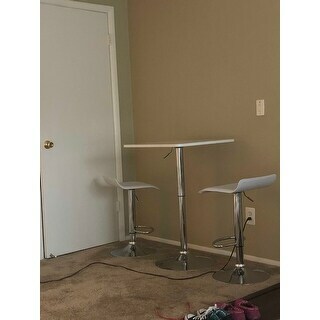 very easy and good to install came in 5 days before so fast shipping nice and small so can fit almost anywhere the chairs and tables go up and down for the perfect height also easy to clean and maintain. Nice set. The item was as described and fitted with my décor. My only concern was that a part was broken, probably during shipment and just annoying to have to call to have it replaced. Great price, fast delivery, nice product!! It looks nice and it would look perfectly fine in my dinning room. "How do I stop the table from swiveling?" This table cannot be locked into a single position as it is designed to swivel.